Laurino walks home from the opening of the Sauganash Trail in 2008. Image courtesy of 39th Ward. As “mini mayors,” Chicago aldermen have a huge influence on the kinds of projects that are built in their districts. 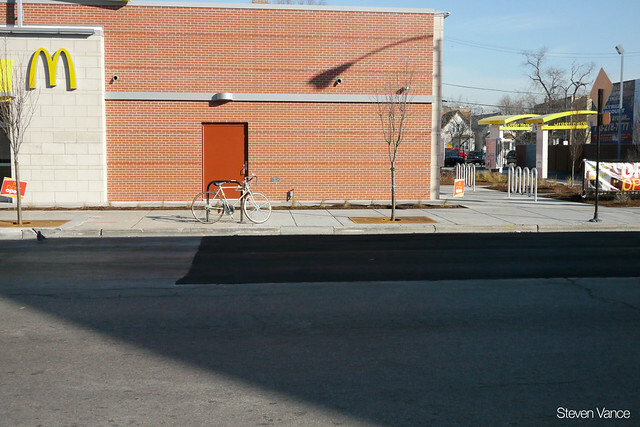 For example, a handful of aldermen have opted to use “menu money” discretionary funds to stripe additional bicycle lanes in their wards or bankroll innovative transportation projects, like the Albany Home Zone traffic-calmed block in Logan Square. On the other hand, they can stand in the way of progress, as when former 50th Ward Alderman Berny Stone put the kibosh on a bike bridge over the North Shore Channel in West Rogers Park. 39th Ward Alderman Margaret Laurino’s Far Northwest Side district includes parts of the Albany Park, North Park, Sauganash, Mayfair, Independence Park and Old Irving Park neighborhoods. The chairman of the City Council’s Pedestrian and Traffic Safety Committee, she’s probably best known to cyclists as the sponsor of a new ordinance that bans texting and talking on cell phones while cycling. But she’s actually one of City Hall’s outspoken advocates for sustainable transportation. As part of our ongoing project to interview all fifty of Chicago’s aldermen about sustainable transportation issues in their districts, I recently caught up with Laurino at her ward service office, 4404 West Lawrence, to get her views on walking, biking and transit issues in her ward and citywide. I’m surprised it took me so long to actually visit Transit Tees, 1371 North Milwaukee in Wicker Park, since I pedal by the store regularly, and much of the transportation-themed gear they sell is right up my alley. Founded by Tim Gillengerten, the business has been selling t-shirts featuring CTA- and bicycle-inspired designs at local street festivals for years. This fall they opened the brick-and-mortar store, packed with shirts, wall art, mugs, neckties, messenger bags, jewelry and even stuffed pigeons. Almost all of the products are designed and manufactured by the company, with much of the work being done in the back of the store. Tim told me about the history of the the business, talked about some of his bestsellers and explained why he thinks mass transit-themed schwag is an idea whose time has arrived. We’ve been open at the retail location here since November 15, so it’s about two months. And did Transit Tees exist as a business before that? It did. We evolved it and refocused it as transportation-focused so we sort of shed all of our other product lines and now we’re mostly focusing on subway, bicycle, any form of transportation, planes, walking, and also Chicago and the Midwest, Great Lakes region.